Telluride, the onetime mining outpost turned ski-bum paradise nestled in the far end of a box canyon, has seen its share of what one local calls “Hollyweirdos.” Starting with 1969’s True Grit, starring John Wayne, half a dozen movies have been filmed in the area, and A-listers from Tom Cruise to Oliver Stone own or have owned property there. The town has a year-round population of just 2,400, and its longtime residents, who know each other’s business like dorm mates, can be dismissive of tourists. But they can also latch on to the weekly infusion of new faces and out-of-state money when they need an escape. So it was no surprise that when the crew, with their hefty Hollywood per diems, arrived in the town in late 2014, things got a little out of control. When Colorado ponied up a $5 million tax incentive, the decision was easy. “Their interest in having us shoot,” says Gladstein, “is because we spend a lot, eat a lot of food, and drink a lot of booze.” But Telluride had other appealing aspects — namely four weed dispensaries. “The fact that you could legally smoke weed in Colorado helped seal the deal,” says one local who worked with the crew. The movie was filmed in 70 millimeter — Tarantino’s preference — and, as per tradition, champagne was broken out after every 100th roll of film was shot. A theme bash would soon follow. One night Tarantino hired a mariachi band, according to attendees. On another he arranged for an Oktoberfest, complete with two Saint Bernards and barmaids dressed up in revealing lederhosen. Although Telluride received heavy snowfall in the early months of production, the precipitation abruptly stopped in January, halfway through. Locals became restless, as they do when it doesn’t snow, and because the movie’s scenes required snow, the filming slowed to a crawl. Killing time, crew members grabbed shotguns and rifles and began shooting beer cans. But as the weeks wore on and the bills piled up, the stress mounted and talk briefly turned toward packing up and heading to Wyoming or Utah. 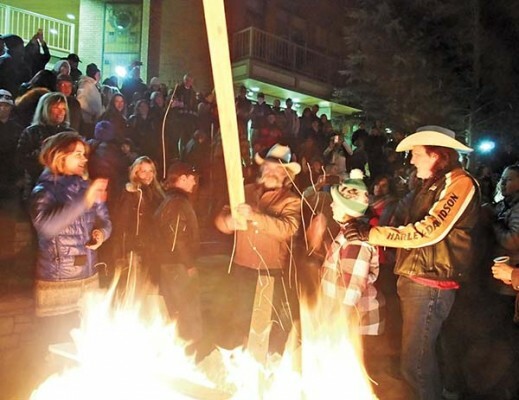 To help boost morale, Tarantino, Jackson, Michael Madsen, and others joined locals in a longtime tradition to appease the snow god: the ski burn, a bonfire in the middle of town that’s stoked with wooden skis. Whether it was luck, the ceremony, or a Native American hired to do a snow dance on the set a few days later, two feet of white stuff soon blanketed the town. With the snow back, work resumed. But as Gladstein soon learned, the cars the crew rented didn’t come with snow tires. “It was ridiculous,” he says. Soon enough, they were sliding into ditches with almost comical regularity. Armstrong’s Telluride Tire and Auto Service wound up selling about $160,000 in snow tires and chains. So the crew, with their per diems, partied, especially during the lull. “They would give you a hundred-dollar bill and buy a couple of drinks and say, ‘Keep the change,'” says O’Bannon’s owner, Ann Marie Fitzpatrick. “And you’d say, ‘Um, the tab is $28. '” Tarantino, who favored honey-flavored Jack Daniel’s, signed O’Bannon’s hats and even put up with patrons asking him for details about his movies. According to local legend, he hooked up with at least one woman in the bathroom and, living up to his foot-fetish reputation, is rumored to have sampled the toes of a few local girls.